All lunches and dinners at Chabad will include Vegetarian and Gluten Free Options. There will be plenty of food each time and you won't go hungry! To RSVP email leah@jewishcu.com and let us know which meals you will be joining us. Lunch at the Wilhelm's Home 1:00pm. You must RSVP. 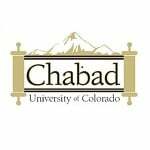 Lunch at Chabad 1:00pm. You must RSVP. Breakfast served at Chabad, 8:30am right after Shacharit. Kosher for Passover Lunch and Dinner will be served at the Kosher station at C4C. Grand Passover BBQ for students only at 6:30pm - 7:30pm. Breakfast served at Chabad, 8:30am right after Shachrit. Kosher for Passover lunch (no dinner) will be served at C4C. The conclusion of Passover is celebrated with a Festive Dinner. Join us at the Wilhelm's home at 6:30pm. If you would like to give a donation towards the costs of the meals click here.